Toronto-raised actress Vinessa Antoine says she was floored when she realized her leading role in the new series "Diggstown" marked a milestone for representation on prime-time TV in Canada. 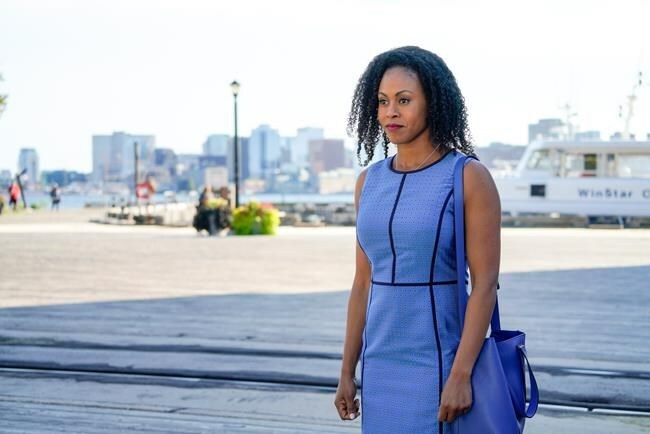 Debuting Wednesday on CBC and the CBC Gem streaming service, the legal drama stars Antoine as a corporate lawyer in Halifax who switches to legal aid after the suicide of her aunt makes her question her purpose in the world. The series is billed as having "the first black Canadian lead of an hour-long drama on broadcast television in Canada," which Antoine didn't realize until after she'd booked the part. "I thought, 'Well, it's about time,'" Antoine said in an interview. "It's so important to be able to have stories that are driven and come from communities that are like mine and like so many other communities that are considered minority communities. It's so important to show that representation, because there's nothing more Canadian, I feel, than multiculturalism and diversity.'" Antoine's character, Marcie Diggs, is also unique in that she's an avid surfer in the area. "Surfing in Halifax is not just a thing — it's a very big thing," said Antoine. "Lawrencetown is a big, huge surfing community. "I think only two per cent of surfers are women and .02 per cent of those are women of colour, so that was interesting. I was an anomaly there.... The ocean is a free, beautiful gift afforded to anyone that wants it, we're just not always represented there," she added, noting she also tried surfing when she first moved to California and got discouraged because she was "literally the only black female on the beach." "So it was nice to be a face that maybe other girls like me might see and say, 'Hey, that might be something I might want to do,' like the girls in North Preston." North Preston is a predominantly black, Halifax-area neighbourhood where Marcie is from and where her parents still live. Series creator/executive producer/showrunner Floyd Kane, hails from East Preston, another predominantly black, Halifax-area community. He said he grew up in a large family and wanted to highlight the lives of the diverse women he saw there. "Having an upbringing where you grew up without running water until you were 14, to being in a room like this, it's sort of an odd, inspiring experience," Kane, who is a former entertainment lawyer, said in an interview at a splashy CBC event unveiling the public broadcaster's fall/winter shows. "I've floated through a lot of different worlds that are not my own, where I've been an outsider," he said. "So in 'Diggstown,' one of the themes in the show is the fact that all of the characters who worked in the legal aid office are on some level outcasts from their community — whether that's by design, by choice, unwillingly — and the idea of setting those characters in that way comes directly from my upbringing in the community that I grew up in." Other characters in the Halifax-shot show include Colleen MacDonnell, the head of the legal aid office in Dartmouth, who happens to be gay. She's played by Newfoundland-born actress Natasha Henstridge, of "Species" fame. "Halifax is like its own character in the show," said Henstridge. "People say that about places that they film but in this case, it permeates everything in the show." Kane said he wanted to deliver "a really authentic sensory experience" of Halifax "like you've never seen before." "I love that our show really highlights some of the communities that are very vulnerable and maybe not as represented in Canada, from black communities to Indigenous communities," added Antoine. "It's not the typical shiny, glitzy legal drama with big, huge criminal cases and corporate cases. It's really just about the salt-of-the-Earth people of Canada that are going through really extraordinary circumstances."